Château de Galinée: your ticket to relaxed country living! There’s nothing quite like camping Brittany style, especially when you can do it in the comfort of one of the very roomy pitches at the Château de Galinée, nestled in the north Breton countryside. Privacy is at a premium when camping, so the large number of caravan pitches boasting substantial hedge and shrub borders at the campsite is a real boon. Little extras like access to your own shed (in premium pitches) with barbecue, fridge and sun loungers – not to mention one hour’s free internet access per day – will help your holiday go that bit better. There’s also a range of mobile home and chalet-style accommodation for those wanting more room than offered by most caravans. The Château also caters to disabled customers in the shape of special accommodation options such as this mobile home with 2 bedrooms for disabled people. This part of France is renowned for both its natural beauty and fascinating towns and villages. 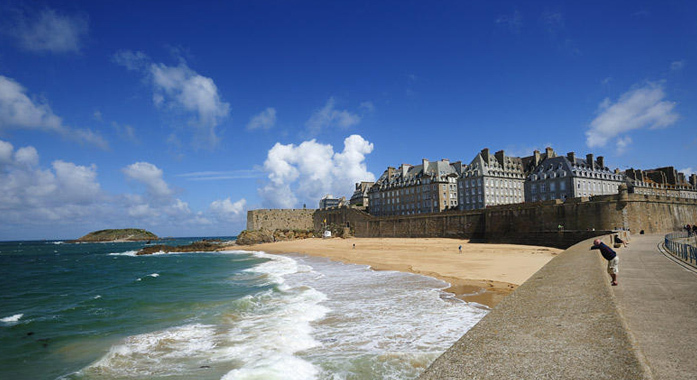 St. Malo, pictured below, used to be the haunt of pirates (the famous corsairs). It’s now know for more peaceful pursuits, being a water sports centre and home to one of France’s largest aquariums.